With only €10.98 in your pocket, you’ve found yourself in Berlin. We can work with this. You’re not in New York. For breakfast, grab a classic brotchen or maybe even go a little crazy and get a Butter Schnittlauch Bretzel — a delicious classic pretzel or pretzel stick sliced and filled with butter and chives — if it suits your taste. They are top notch in the stand on the U6 platform at Stadtmitte (or at least I like and eat them often, whatever that’s worth — but what else do you have to go off of except my opinions in this article?) and only cost €1.20. 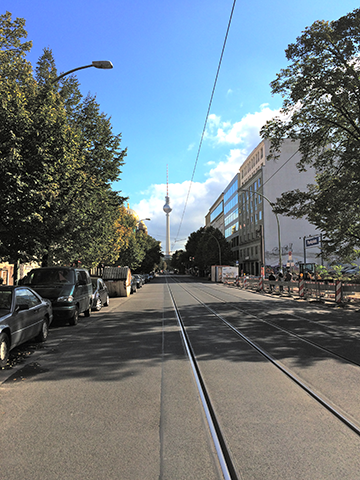 Berlin is very walkable, especially the stretch of Unter den Linden which leads you all the way from the Brandenburg Gate to Museum Island and then finally to Alexanderplatz where by that point it is called Karl-Liebknecht-Strasse. This route is a nice walk in either direction, and along the way you’ll pass the memorial in Bebelplatz in front of a Humboldt University Library that commemorates the book burnings that were organized by students and took place in 1933. The memorial is a glass square set into the ground through which one can view empty bookshelves, symbolizing the books lost in the fire. Museum Island is beautiful to walk through even if you don’t have time (or funds) to see the insides of its many museums. While this walk along Unter den Linden is great and the central area ‘Mitte’ of Berlin is very walkable, you may still want to buy a Berlin AB public transport day pass for €6.70 since it will get you around faster than anything. 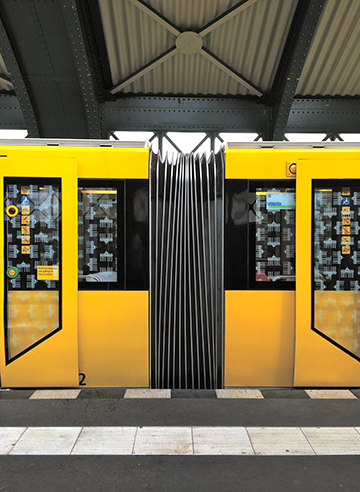 With a day pass, you can use any bus, U-Bahn (train/metro) or S-Bahn (train that stops less, goes longer distances). Or, you could keep in mind that a single ticket is €2.60 and be careful with when you use your single trip. Alternatively you can rent a bike for around €5, but be sure to check return times. A metro pass, carefully planned single trip, or bike is useful in the evening (or just when it’s cold) for hopping around to free events. When you’re finished walking around Mitte, hop on your chosen means of transportation and if the weather is good, head to Tempelhofer Feld. The old converted airfield is the perfect park for a picnic. Bring a friend and food. 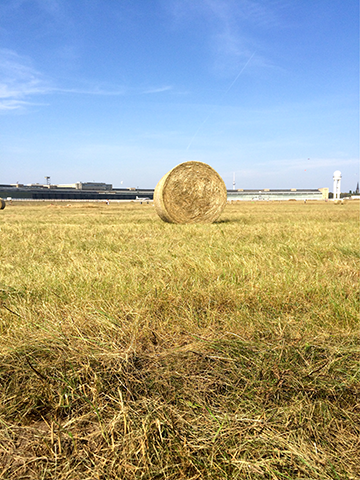 Walk around, make a few more friends among the field mice, and climb on the bales of hay. Now for a meal. There are lots of options. I’ll list a few in different areas, and you can choose which to do for each meal depending on your location. If you’re near Mitte or anywhere off the U6, Mehringdamm isn’t far. The Mehringdamm stop hosts the most famous döner stand — Mustafa’s Döner Kebab, as well as Curry 36, a famed currywurst vendor. Expect to spend around €3.00 at either place. If you’re near Eberswalderstrasse in Prenzlauer Berg, Konnopke’s Imbiss is located under the tracks and is also known for its currywurst. Also around €3. If you’re near Oranienstrasse or Görlitzer Bahnhof in Kreuzberg, Rissani is a Lebanese establishment with delicious falafel for only €2 It’s the best I’ve had in city so far. Maybe buy an extra. If you’ve ventured down to Neukölln, Sahara Imbiss serves excellent tofu, falafel, or other meat sandwiches drizzled in delectable peanut sauce for around €3. They claim their cuisine is Sudanese, but they seem to have adapted aspects of Sudanese cuisine to the tastes and preferred or popular dishes of Berliners. Personally, I believe the peanut sauce is a welcome addition and improvement on any food item. 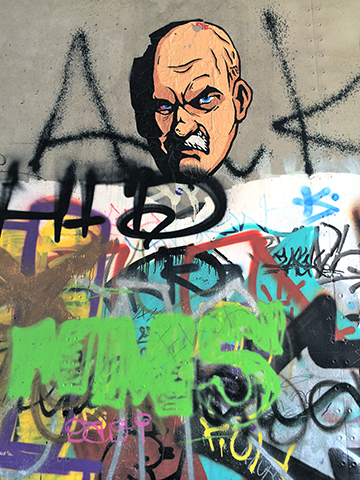 With your döner, wurst, or falafel in hand, venture to the East Side Gallery and see the famous graffiti for free. One can also freely stroll through the Tiergarten (Berlin’s Central Park) or Park am Gleisdreieck (Kreuzberg) in good weather. Since we’re limited to the equivalent of 50 dirhams, in lieu of the (wonderful) large art museums and institutions, check out www.index.de for free gallery openings and events happening for the given night. Free events don’t always mean free refreshments, but you never know. If by whatever combination you’ve concocted of the above recommendations you’ve managed to still have around €1 or 2 left on you, stop by a Spätkauf (convenience store) for a cold drink or snack and take it for a walk along the Spree or Landwehrkanal.